Everyone has a part of himself that no one else knows about. In a teenager, it’s a healthy move towards becoming independent. In an adult, it can keep the spark of romance alive. But when do secrets become destructive? What drives a person to live a double life – to be a soccer dad by day and a pimp by night? To live one part law-abiding, upstanding citizen while another part secretly shoplifts, gambles away the college fund, or even commits armed robbery or murder? Everywhere, we’re discovering that our neighbors trade spouses, are married when they’re secretly gay, or are up to behavior that no one ever expected from them. 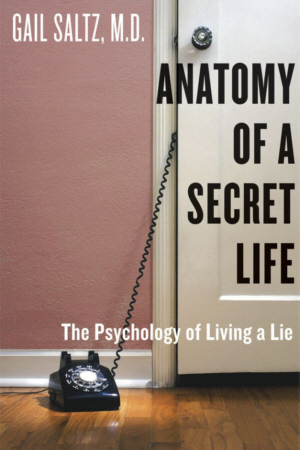 Psychoanalyst Gail Saltz delivers a profound examination of how a secret life is formed, lived, justified, and exposed. She shows through historical figures as well as contemporary case studies what pushes people to deviate so far from the norm that they end up wreaking havoc on their own lives and the lives of those around them. Gail Saltz, M.D., is a psychiatrist, psychoanalyst, and the mental health contributor to NBC’s top rated Today Show as well as a frequent guest on Oprah. She has contributed articles to Parade magazine, has a regular column on MSNBC’s website, and is a contribution editor to Glamour magazine. She has appeared on CBS News, Dateline, and has been featured in The New York Times, The Daily News, and The Los Angeles Times. Married and mother of three, she lives in New York City.